NEXT | Know Your Lore: What about Gnomes? A new patch is now available for testing on the Overwatch PTR, including a couple of significant changes to Ana. 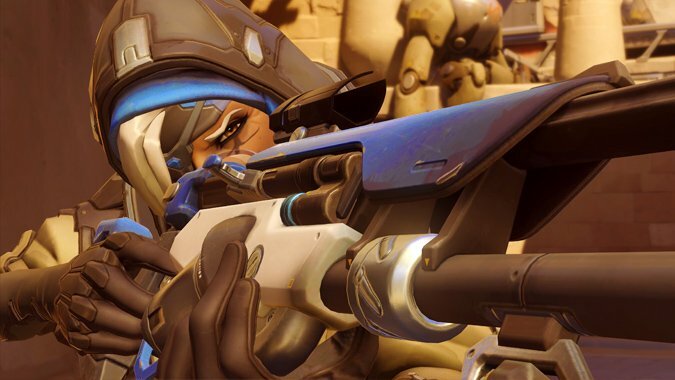 Ana’s Biotic Rifle is now going to ignore allies with full health, meaning her shots won’t be wasted on those who don’t need the healing. In addition, her clip size is being bumped up from 10 to 14. Both of these changes should make her a little more appealing as a Support choice in gameplay. On the other end of the spectrum, Brigitte is getting a couple of nerfs. Her Rally ability will now grant a maximum of 100 armor per player, down from 150. Her Shield Bash is also getting an increased cooldown, bumped up from 5 to 6 seconds. The PTR also includes some changes to player warnings. Behavior warnings will now let you know that if you keep up the bad behavior, you may face account closure as a consequence. In player warning popups, the term “Griefing” has been replaced by “Gameplay Sabotage” — a much more specific designation. The PTR also includes a boatload of bug fixes as well — you can read the patch notes in full below. While the Ana changes are interesting, players have expressed some concerns regarding other issues with the hero. She has fairly low mobility on the field, and not a lot of survivability, either. Beefing up her healing is all well and good, but what about her other weaknesses? Wouldn’t it be better to beef up her chances of overall survival? Overwatch Developer Geoff Goodman hopped on the forums to discuss a little design philosophy, and how the team looks at balance issues, and Overwatch heroes in general. One aspect of our heroes that is very important is that they all have various strengths and weaknesses. This is a core aspect of what makes teamplay so important in Overwatch. If you have an Ana on your team, this gives you certain advantages such as being able to be healed from very long range, having a more offensive-favored ultimate, and having the ability to disable healing on enemies (which can be especially vital against heroes that really rely on healing such as Roadhog). That said, she also brings her own weaknesses that must be managed, such as low mobility and lower self-healing. A team may opt to run Brigitte or Lucio with Ana to help peel attackers off of her, for example. When we want to buff a hero, sometimes it can be the right call reduce these weaknesses. For example, if a weakness is just too overbearing or a hero just has too many weaknesses compared to their strengths. But more often we would rather amplify a heroes strengths and make the hero just better at what they do, which leaves their weaknesses still around for enemies to exploit and for allies to try to manage. I hope this helps explain how we look at balance issues and heroes in Overwatch in general. On the one hand, this makes sense — you don’t really want any one hero being too powerful. And despite her squishy nature, Ana has the potential for being pretty powerful. She’s a Support that can heal at incredible distance without necessarily needing to be anywhere near the action to be effective. At the same time, when other Support heroes have both effectiveness and survivability, it means players will tend to lean towards those heroes, and ignore Ana entirely. We’ll have to wait and see if the boosts to Ana’s abilities are enough to make her a more appealing choice. If you’d like to test the Ana changes, hit the Overwatch PTR — and don’t forget to leave your feedback on the PTR forums as well.